Lot Size: 45300sq. ft. 176ft x 256ft "Rectangular"
This large 1.1 acre lake lot in The Shores subdivision on Lac des Isles has the space and privacy that you are looking for. 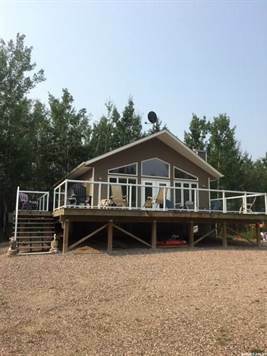 The well built cabin has a full basement with ICF walls and fully finished. Three bedrooms up and 2 down so lots of space for family and friends. The deck is 680 square feet so great for large gatherings. Year round use so enjoy all 4 seasons in this great recreational area. Lac des Isles is one of the largest lakes in the Meadow Lake Provincial Park. Great fishing and water sports in this outstanding Lake. The Northern Meadows Championship Golf course is just a couple miles away.